Generally an opponent of weed, Mike Fagan stepped in to help a retailer. 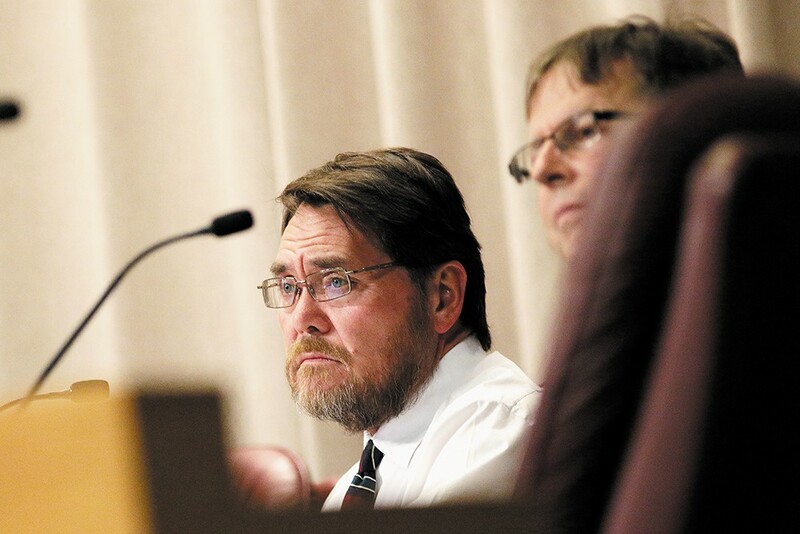 Spokane City Councilmember Mike Fagan is calling "shenanigans." Fagan, the lone conservative councilmember and traditionally an opponent of the marijuana industry, proposed an emergency ordinance that would shrink the buffer zone between recreational pot shops and businesses labeled "arcades" from 1,000 feet to 500 feet. Fagan proposed the ordinance after owners of Smokane complained that a video arcade had opened less than 1,000 feet from their new location, the Spokesman-Review first reported. The arcade opened while the pot shop was getting its city and state licenses squared away, drawing suspicion as to its legitimacy. By a 5-1 vote, Spokane City Council reduced the buffer zone to 500 feet for six months. Meanwhile, in Spokane County, the Board of County Commissioners recently lifted a ban on new outdoor marijuana farms that was originally put in place after a vote with no public notice. However, in lifting the ban in June, the three-person board imposed additional requirements on new weed farms. Now, to start a farm in Spokane County, growers must get a conditional use permit, which requires a public hearing. You can now puff puff pass with impunity. Previous state law disallowed sharing even a single nug, but now stoners can share up to a half ounce of flower, 8 ounces of a solid edible, 36 ounces of a liquid edible and 3½ grams of concentrates. Growing for personal, recreational use is still illegal, but medical marijuana card holders can now buy seeds directly from producers. Under previous state law, producers could not sell seeds to patients. The state Liquor and Cannabis Control Board, which regulates the industry, must now study options to clear a path for recreational users to grow their own plants. Washington is the first state to test the organic marijuana waters, sort of. Growers still can't technically call their bud "organic," but a new law creates growing standards similar to those established by the U.S. Department of Agriculture's National Organic Program. Dispensaries can now give out lockable boxes for free, in an attempt to keep weed away from kids. Previous law barred the shops from giving away lock boxes for no charge, even if the boxes were donated to the shops. Weed remains illegal at the federal level, and as it has since 1970, cannabis maintains its spot on the list of Schedule I substances alongside LSD, heroin and Ecstasy. But since 2014, the feds have more or less looked the other way in the 28 states, plus the District of Columbia, that have legalized medical marijuana. That's because of a congressional spending bill that bars the federal government from spending any money prosecuting medical marijuana growers, as long as they comply with state laws. The spending bill, which does not apply to recreational weed, was renewed in May of this year, offering hope for legalization advocates, especially given U.S. Attorney General Jeff Sessions' outspoken opposition to marijuana's health benefits. Indeed, Sessions has asked congressional leaders to scrap that element of the bill. In a letter dated May 1, 2017, Sessions argued that the amendment "restrict[s] the discretion of the Department [of Justice] to fund particular prosecution, particularly in the midst of an historic epidemic and potentially long-term uptick in violent crime." • Total marijuana sales statewide cracked the billion-dollar mark in the 2017 fiscal year at $1.22 billion, translating to $281 million in taxes.